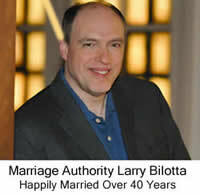 Back in the 90′s, Larry Bilotta was suffering MISERABLY in a loveless marriage. He needed a way to reduce the stress, anxiety and tension in his marriage. Not because he was devoted to his wife, but because he needed to maintain his own SANITY. Larry’s wife didn’t believe in divorce. Needless to say, Larry set out on a mission to find a REAL solution to their ongoing struggles. And after 27 years of misery – he finally found it. Today, Larry and his wife have been happily married for 40 years…and they’re closer than ever. Larry is one of the few marriage experts who actually transformed his OWN marriage and today, holds the key to bringing back a marriage from the brink of divorce – even AFTER the papers have been filed. At the core of Larry’s teachings is his “secret method” that allows individuals to transform themselves from the inside out, and positively influence their spouse as a result. By learning to eliminate their negative feelings in just 60 seconds, Larry has taught individual spouses how to completely change the environment of the marriage through his Environment Changer program for the past 15 years.